Have a question for Grande Villas by Diamond Resorts? "There is a convenience store and take out on site." 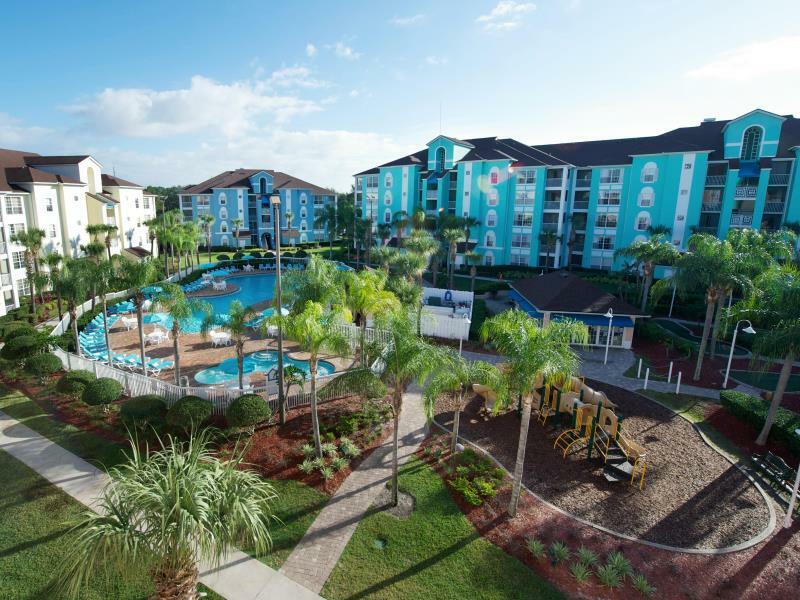 "This hotel offers many activities for all ages, including sc..."
Ideal for fun and relaxation, Grande Villas by Diamond Resorts is located in the Disney Downtown Lake Buena Vista area of Orlando (FL). From here, guests can enjoy easy access to all that the lively city has to offer. With its convenient location, the hotel offers easy access to the city's must-see destinations. Simply put, all the services and amenities you have come to expect from Diamond Resorts International are right in the comfort of your own home. To name a few of the hotel's facilities, there are convenience store, gift/souvenir shop, 24-hour front desk, car park, BBQ facilities. All guest accommodations feature thoughtful amenities to ensure an unparalleled sense of comfort. The hotel offers an excellent variety of recreational facilities, including mini golf course, hot tub, fitness center, outdoor pool, children's playground. Superb facilities and an excellent location make the Grande Villas by Diamond Resorts the perfect base from which to enjoy your stay in Orlando (FL). "Super friendly staffs and worth the money that you pay for!" We were approached to attend a talk on time share which was very surprising to us. Nevertheless, we rejected the invitation. I have stayed at both of the Diamond Resorts accommodation complexes at Cypress Point and Grand Villas in Orlando, USA and on every occasion I have found the same high standards of accommodation, facilities and friendliness of staff. This resort has everything our family needs and wants. It’s super clean, has three pools and jacuzzis, entertainment, mini-golf, poolside movies and so many other amenities for your enjoyment. Wish we weren't so busy at nearby Disney so we could enjoy all the amenities! Our villa was huge for the price we paid, and it was spotless, even to me, who has attention to detail as a curse! Only problem was the dryer took several cycles to dry our clothes. Ended up having to dry a few items at a time. We stayed here so we could easily access the Disney parks and shop during our vacation. The location was great - 15 minutes drive from all Disney parks and Universal Studios, less than 10 minutes from Disney Springs and SeaWorld and less than 5 minutes from the outlet mall (you could walk). There was enough parking on site which was part of the resort cost. The pools and gardens were beautifully maintained and the room was large and had everything we needed. There is an option to cook with a fully functioning kitchen. The bathroom was great with a big bathtub. The room has a large king bed in the bedroom and a pull out couch which turns into a queen bed. Both beds are comfortable. Outside our room was a laundry - free to use! The staff were friendly and beyond helpful and even though the rooms are not serviced daily they knock on the door each day and offer towels and products (laundry powder, toiletries etc). I would definitely stay again! Be careful of booking this property, especially through agoda. Agoda do not tell you about the resort tax! When I booked for September this year the wording for this resort read “ all fees and taxes included “ then went on to show a figure of £136.85 for all taxes and fees that was included in the price of the rental. The confirmation did go on to add important information that warned that there was construction going on at the resort for all of our stay. That’s fine what it should of read was the resort tax payable to the hotel ! $13.99 per NIGHT which worked out a whopping £155.50 on top of what we paid for the stay , and a chunk out of your spending budget. People should be aware of this charge , it can not be pre paid , it is payable direct to this hotel. Not every hotel charge this resort fee , also not all travel agents online tell you , they should. Also I have stayed at this resort before , and have known about the resort fee but was misled by agoda in their wording. Fantastic location, well kept grounds and nice facilities. However very hard sell for time share (everytime you speak to staff) and phone calls to room. Watch for drink prices at the pool. Everytime I bought a beer it was a different price to when my wife did. (charged her more on 3 occasions) I know its only $1:50 each time but it shouldn't happen. Right when we walked in we whwre greeted by a warm and welcoming staff, they offered us water and gave us all the information about the resort and the facilities in and around. Once we got to the room we noticed it was very clean, came with all the cooking supplies you would need and a nice kitchenette. The bed was large and clean and the wash room was a very nice size had a bath and shower and was extremely clean. The location was perfect, 10 minutes from Disney and malls as well as 1 hour from the ocean. The only con is the facilities in the resort. Everything costs money from drinks to playing pool and the quality of what is offered there isnt the highest. There was even a "bingo" event outside that at the end they "gave out" on scoop of ice cream for only 1 dollar. For a place to stay I highly recommed but if you are looking for a place to take use of all of the facilities, I would look elsewhere. The hotel is so clean and equip with all facilities that you can imagine. Super friendly staffs and worth the money that you pay for! I would like to recommend all to stay in this resort, economically also perfect place to stay I rate this resort 10 out of 10. We stay in a two bedroom condo style room. It has a full kitchen, dining room and living room. There are two full size bathrooms in the unit. There is one smaller bedroom with two single beds, a pull out couch in the living room and a large master bedroom with a jacuzzi style tub in a full size bathroom off the master. Wherever your unit is you are close to a pool and hot tub. This hotel offers many activities for all ages, including scavenger hunts, mini golf, karaoke, live entertainment, beer and wine tastings and poolside movies. There is a convenience store and take out on site. This is a very clean and well maintained hotel. I never stay anywhere else when in the Orlando area.